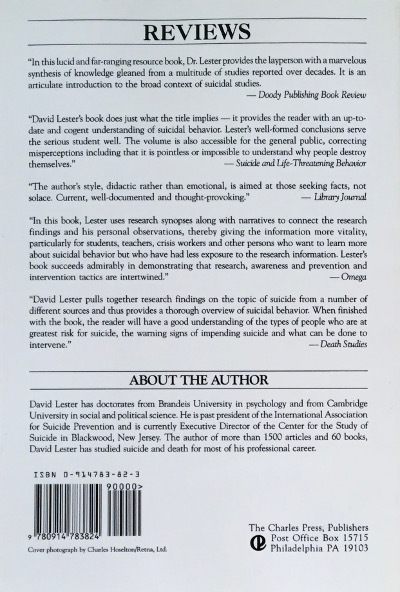 In this important book, world-renowned suicidologist and bestselling author, David Lester, PhD, offers an up-to-the minute look and a thorough overview of what we currently know about suicide, its causes, and what we can to to prevent it. By synthesizing the plethora of research into a well-organized and understandable presentation of the most salient research, Dr. Lester has succeeded in creating a book that is accessible to all readers. Recently elected President of the American Association of Suicidology, Dr. Lester, who has studied suicide for nearly 50 years and is the recipient of the Dublin Award for Outstanding Lifetime Achievement from the American Association of Suicidology, has deservedly achieved worldwide recognition as one of the leading authorities on suicide. 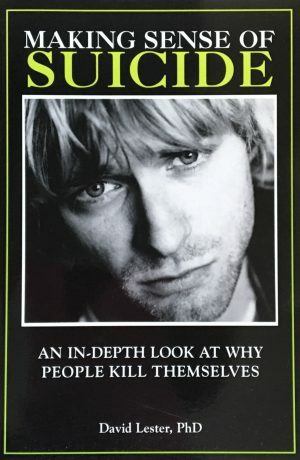 He is past president of the International Association for Suicide Prevention and currently Executive Director of the Center for the Study of Suicide in Blackwood, New Jersey, and Professor of Psychology at Richard Stockton College of New Jersey. Dr. Lester is the author of more than 2500 articles and 100 books.